You know I love vintage stuff. But I draw the line at things that could burn the house down. 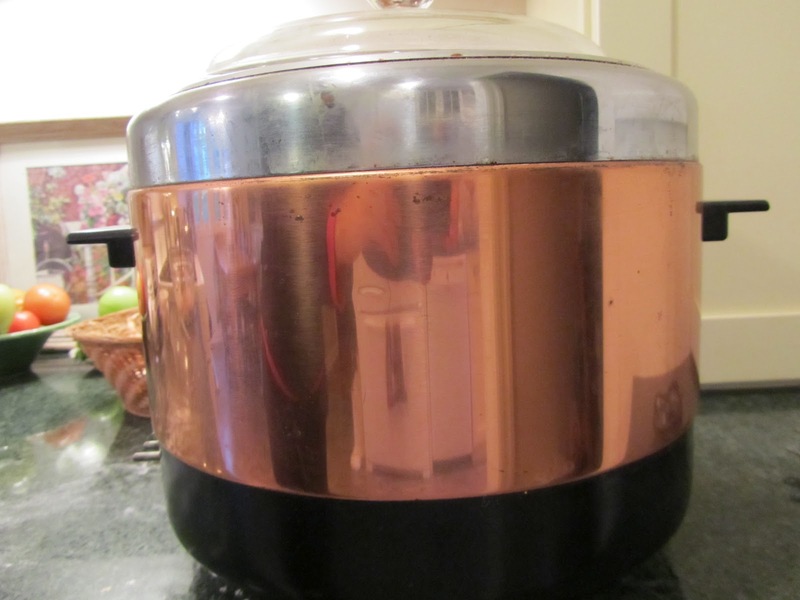 This is my slow-cooker, honest to goodness! My mom bought it in 1972 (yes, back before Y2K, even). The last time I used it, it burned a hole into the formica countertop beneath it. I've been a bit afraid to use it since. When do you draw the line on old appliances? My mom's toaster and iron had cloth-covered cords. I remember noticing the cords on friend's appliances, and wondering why new ones had plastic covered cords. Some things continue to work safely. Like my parent's Osterizer blender. It had a toggle switch with 2 speeds, on and off. Eventually these appliances were retired. But I continued to use the slow-cooker for many years, until the overheating problem. Now I am ready to set foot into a retail establishment and buy a replacement. This one would make a nice fish bowl, or pot for a plant, or bucket for water the next time I wash my car. Anyway, I am wondering, what brand and size of crock pot do you use? What are it's drawbacks? What do you love about it? Would you recommend that one to someone else? What kind of recipes do you use it most often for? How many people do you usually feed with it? I know, a lot of questions. I'm trying to determine if the one you have would also work for me and my family. I really appreciate your advice. Thanks! As I write, my slow cooker is busy cooking Chicken Adobo for our evening meal...it's a Frigidaire, bought in our local discount 'Factory Shop' for its cheapness alone! I think it must be 3-4 litres, it's lost a foot so is a bit wonky but nothing that a tea towel positioned correctly won't cure. It does the job for us, but my kids are smaller than yours and there's less of them! Good luck! Hi Sarah, thanks for your info. 3 to 4 litres is roughly just over 3 to 4 quarts, I believe. I was going to check its measurements more accurately out of interest, but there was too tight a turn around between yesterday's Chicken Adobo and today's Spicy Chickpea Curry/Stew thing...it's definitely slow cooker season!! So yours really gets a workout. I'm looking forward to having a new one. I a couple of days a week that are just hard to get dinner done by a reasonable hour. Thanks for considering getting it's actual measurements. Someday, if you do, just let me know. I tend to shy away from used electrical appliances especially ones that heat. However, I recommend that you get a older crock pot. The reason being is that they seem to heat more gently and uniformly that the new ones. Everyone that I know with a newer one has found that there is usually a hot spot and it seems to be hotter overall. However, there a lot of new features the most useful one I think are the clamps to hold the lid on. That makes it much easier to take one to a dinner. I have a 20+ year old Rival (upright style) with low/high heat options. I was given an oblong Proctor Silex (newer but not *new*) with warm/low/high heat options. I like both for different reasons. Live & Learn is right, the older ones heat more gently and uniformly (I even read this in a crockpot cookbook I checked out from the library!). It's great for soups/stews. The oblong style is easier to use for roasts or if you are making lasagna/casseroles, although it will also work for soups and stews. I frequently find myself turning the Proctor-Silex to "warm" especially if I have something creamy/cheesy in it to avoid burning. The new crockpots do everything but clean the kitchen so good luck! Oh, another thought--both of mine are 4 quart sized. I have noticed that the newest recipes are often geared for 6 quart, so it might be helpful to determine how many people you want to serve before you make a decision on sizes! That's so interesting, about older models heating more gently and uniformly. I never would have known that, so I thank you both for that info. And it will save me some money, too. And Kris, the size info on recipes, I've noticed that too, mostly being for 6 quart models. I'll keep that in mind when I shop. Thanks you, both of you! Well, I never noticed the crockpot size on recipes ... until I was in the middle of a recipe and realized my crockpot was too small to fit all the ingredients in! D'oh! Fortunately I DO have 2 crockpots so I was able to save the day. Oh, no! Good thing there was a spare, ready and waiting for the rest of the ingredients! That sounds like something that would happen to me! I just got back from Walmart and they have Crock-pot brand crockpots on sale for $19.99. 4 quart size, oblong shape, warm/low/high heat. Ooh, thanks for the heads-up. I'll check Walmart this week. I use a Rival brand crockpot. My current one came from Target. I took advantage of a sale and had it shipped to me several years ago. It is a simple high/low/warm kind of thing and is about 4 quarts. I also had a 6 quart that I gave to my mama when she moved because she didn't have one at all. The 4 quart works fine for meals for 3 or 4 people, but won't hold super large cuts of meat. I can fit a whole chicken in it though. If you will be doing extra large meals or huge pieces I recommend a 6 quart, but there is a down side because I found it harder to cook smaller meals in the larger one. I keep thinking I want a programmable one and then I tell myself that that is just one more electronic piece to mess up...lol. yeah, I think you're right about having too many functions just leading to something breaking down sooner. I think that about a lot of appliances, the simpler the better. Thanks for the info on size and large cuts of meat, or large volumes. I'll have to actually make a choice. Having just been given my mom's old one, I never had to make a choice based on size. Sometimes, it's just easier to accept what's given, isn't it?! We had a Rival brand crockpot for many, many years and when it finally conked out, we went without for a couple of years, but it's just a great appliance to have that we finally purchased another. Since most of the children had moved out we opted for a smallish one (3-4 quart size, I think. But too often the hunk of meat we planned to use in it was too big. yeah, we could it but ... So when we saw a larger crockpot on sale, and which also came with a mini on, we splurged to purchase it. The mini one is great when company's over, etc. and the large crockpot is used when we want to make a large quantity or use a big hunk of meat. Probably our most favourite recipe is the bbq'd pulled beef or pork dish that we do. Oh, if only I could be so lucky as to find one that came with another. But, if I do find one used, perhaps saving substantially on it, I could also by one of a different size, used. And all costing maybe just over what one, brand new might have cost. Thanks for your input! Now, to choose! We have two! I wish I could give you one! One of the ones we have has three different size pots that you can switch out depending on the size of the dish, which is pretty cool. Mostly I've just used mine to make curry and chili--haven't tried much else in it. Thanks for your advice. I think I will focus on larger models. Not only will I want something large enough for our family, but I'd like to have one large enough for larger gatherings. I love our crockpot, it's a large one, a rival. However, I would like to have two, a smaller one. The larger one is great for roast etc, and a large chicken as well with the vegetables. AND you can always freeze leftovers for later on. BUT the smaller one would work for us as well, sometimes the bigger one is just that, too big. Good luck with your decision making! That's what I'm hearing, that having two would actually be a nice thing. I guess it only makes sense, we have more than one pot or pan for the stove. Thanks for your input. I can hardly wait to have a working crock pot again! I have a 4 litre one and I find it too small even for the two of us (doesn't make enough leftovers!) Would definitely go for a large one! That's good to know! Thanks for your input!